An average of 1 hour and 48 minutes per day — a story about our daily ‘move’ment begins. Corporate brand communication channel ‘& Kakao’ will embark on its second campaign of ‘Move & Kakao’, Kakao Corp (CEO: Ji-hoon Rim) announced on Sept. 7. ‘& Kakao’ is Kakao Corp’s official brand channel that communicates stories about Kakao’s service, technology, culture and people. Last February, ‘& Kakao’ launched its first campaign ‘People & Kakao’ in the form of storytelling by Kakao employees, who were each interviewed to share their personal experiences as IT experts, executives and staff members. The second campaign ‘Move & Kakao’ centers on the daily ‘move’ment of an average Korean person – 1 hour and 48 minutes – and shares people’s stories about their experiences with Kakao transportation services, such as Kakao Taxi, Kakao Driver, Kakao Navigation and Kakao Map. 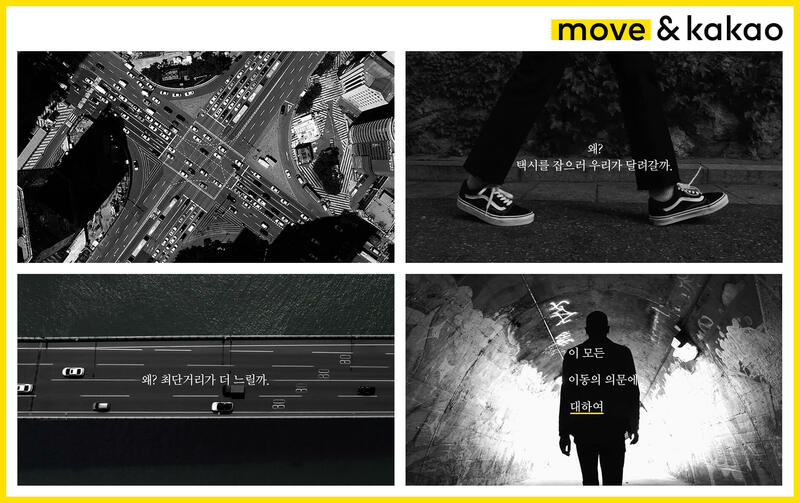 Released on Sept. 7, the first video clip of ‘Move & Kakao,’ ‘Intro시작 [Move, 움직이다 (“Shift”)],’ retraces and reexamines the meaning of the word ‘move’ – shift, change and progress – by questioning what it really means in our daily life: Why is there a traffic jam? Why is it so hard to grab a cab at certain hours? The second video ‘Chapter 1 [Move, 이동하다 (“Travel”)]’ will be released next week and provide some interesting insights about people’s ‘move’ments based on the analysis of Kakao’s Big Data from Kakao Taxi, Kakao Driver, Kakao Navi and Kakao Map. Some of the information will include the top real-time searched locations in Korea 2017, the best way to use Kakao services on your way back home from holidays, and travel stories about food tours in Jeju Island, Korea, using Kakao Big Data. The following videos are also expected to be released later this month: ‘Chapter 2 [Move, 변화하다 (“Change”)]’ will focus on the transformation of Kakao services that have improved the quality of our daily life, and in ‘Outro맺음 [Move, 나아가다 (“Progress”)],’ Kakao Mobility CEO Ju-hwan Jung will discuss the future of people’s ‘move’ments.